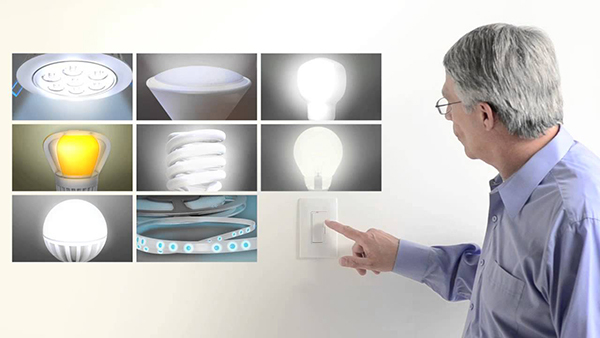 With lamp (light bulb) technology changing so quickly, there has been some confusion about dimmers. Which dimmers work with each lamp type? In the past, each kind of light bulb required a specific type of dimmer. No longer! The Harmony Tru Universal dimmer works with all lamp types. Equipped with a self-calibrating feature, which sets itself to the lamp type installed by the end user, it instantly identifies the lamp as a CFL, Halogen, or LED during installation. The process is very simple and past problems with flickering and poor dimmer performance are eliminated. An on/off decorator switch is combined with a separate slider for dimming control. A green LED glows when the dimmer is off to make it easy to find it in the dark. The Harmony Tru Universal dimmer comes in three interchangeable face colors-ivory, white and light almond, which are included in each package. It is also available in black, brown, nickel, antique brass and dark bronze. The short video below gives you an overview of the product and how easy it is to install. Dimmers give you better control of your lighting levels, which will reduce your energy consumption and save you money on your electrical bills! Come see us to learn more about the new Harmony Tru Universal Dimmer from Pass & Seymour. This entry was posted on Tuesday, February 4th, 2014 at 10:51 pm	and is filed under Lighting Tips and Technology Tuesday. You can follow any responses to this entry through the RSS 2.0 feed. You can leave a response, or trackback from your own site.